Okay, so we’ve done bachelorette gift roundups before, from engaged AF funny to straight-up, no-brainer bach bash ideas, and they’re always fun! This time, we thought it’d be smart to gather up some of the cutest things to distract a bride who might be stressing over what her guy is doing at his own bachelor party or just missing him like cray. Let’s be honest, nearly everrrrry bride has experienced some sort of feels about her future hubby heading out for his last night (or weekend) of singlehood. There aren’t too many pop culture references that reassure the ladies, right?! Well, whether you’re just antsy and anxious over the occasion, or just sad that you’ll be spending some time away from your S.O. right before your wedding (#youveneverbeencloser), you shouldn’t let your nerves dictate your own fun time! We put together a few tips that’ll help you handle the heart palpitations that bachelor/bachelorette parties can engender. If you’re both having fun, chances are you’ll be so preoccupied you won’t have time or energy to stress or ruminate over all the what-ifs. Plus, having your respective parties on the same weekend will ensure one or the other of you aren’t left to fend for yourselves for a day or two. And you won’t have to monopolize all the last few weekends before your wedding - because there’s so much to do already. An idle mind is a dangerous thing… that’s why you need to keep yourself busy and in high spirits. Whether that means instituting a rule where whenever you talk about your groom, you have to take a shot ((okay, within reason... )), or making sure your itinerary for the trip is literally stacked with activities and socializing. Any down time can be dominated by thoughts of what he’s drinking, who he’s talking to, what he’s [hopefully] wearing, what dares his dudes are doling out, so it’s better just to distract yourself. Nothing bad is happening, we promiseeeee. This is probs the #1 best way to deal. You should realize that your bachelorette party is just as important as his time with the guys, and figure out a way to make it through without getting worried over what he is doing (and vice versa, he might be just as freaked out over the possibility of ‘balls flying in your face’). Wear a crown, drink till your heart’s content, get excited about your groom and the fact that your his forever. And if you’re part of her entourage, just make sure she has the best time ever. Buy those rose gold metallic balloons that are just extra enough to make her smile, treat her to ALLLLL the cupcakes, let her believe in unicorns (and if you’re bach-ing after it launches for festival season, get her unicorn makeup to let her feel invincible), gift her with the cutest takeaway and memento of your epic adventure together (i.e. 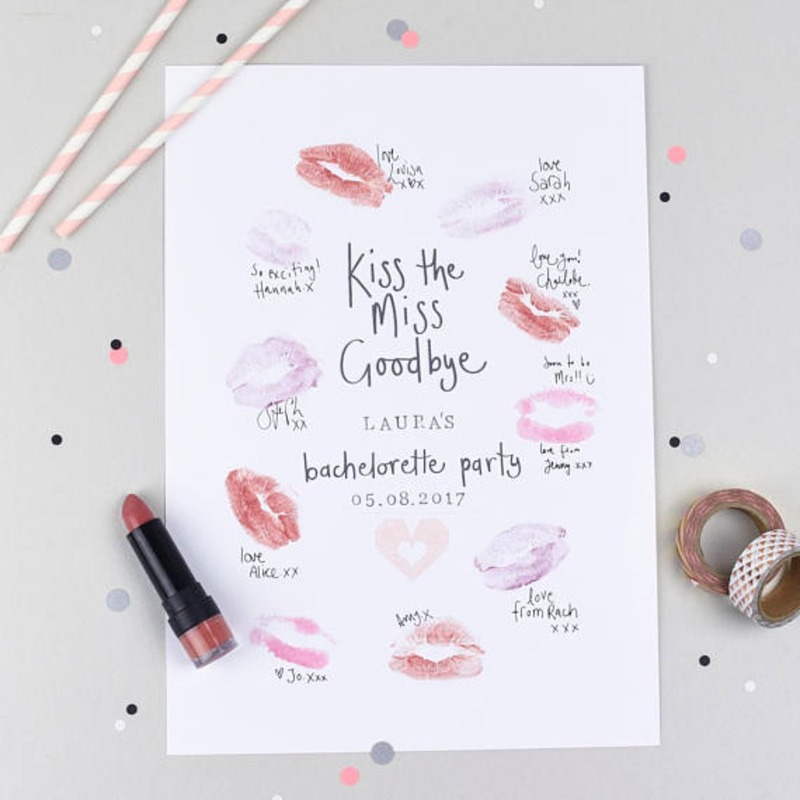 a ‘Kiss the Miss Goodbye’ poster, with your lips in all of her signature shades - 💕 💋 💕 💋 💕). Here are some of our fave picks from Etsy to help you get started… Photo courtesy of TandemGreen.